(CBS News) For all the wonder and beauty there is to be found within nature, sometimes you come across setting that are just a bit... different. This is one of those. Watch in the captured-on-camera clip above as an incredibly surreal sky unfolds right before your eyes. All of a sudden it got very yellow outside, it felt strange and mysterious. Then it slowly looked very orange, it was the craziest thing I have ever witnessed over my head. I almost expected to see a tornado or something! 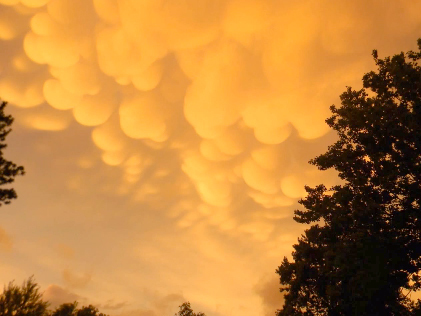 These clouds looked like "Bubble Cups" but in meteorology terms they are called Mammatus clouds. They are extremely rare in this part of the country and many people have never seen anything like it before. And while your blogger here is happy to have learned a new cloud terminology today, I'm still scratching my head over the conditions that created this unusual meteorological phenomena. Anyone have an explanation? If so, feel free to leave me some comment love below. And to check out more videos by Jason Asselin, be sure to visit his YouTube page by clicking here.